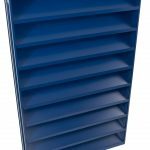 A range of double bank louvres, either contained within a box frame surround or offered with concealed mullions for continuous appearance over large areas. 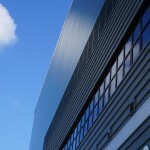 Can be used to provide vision proof ventilation or to act as an architectural facade, or a combination of both. 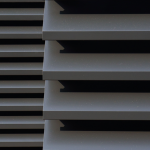 Maximair Double Bank louvres have been subjected to rigorous aerodynamic testing. Double bank of louvre blades are installed with concealed blade support brackets onto hidden support carrier mullions, and are supplied in a series of fully assembled modules to form continuous applications. Alternatively smaller individual units can be supplied in box louvre format, fully assembled with integral top, side and cill flashings. Units can have blade installed in an inverted arrangement to suit the particular application.